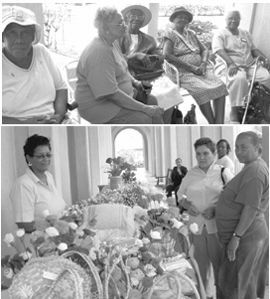 The National Insurance Services (NIS) Golden Years Centres at Black Point and Cane Grove are where senior citizens would normally relax, meet with friends and make craft. Chairperson of the centre, Jillian John said that the outdoor occasion also gave the public a chance to view some of the activities that the senior members are engaged in. She noted that the centre which has been open since February 2005 allows the elderly to get together on Tuesday, Wednesday and Thursday at the two centres, one located at Black Point and the other at Cane Grove from as early as 7:30 a.m. to as late as 4:30 p.m.
John said their day includes religious fellowship, a snack and lunch for just $2.50 a day. She said that the meal and other necessities for the facility are subsidised by government and the NIS to make participation affordable for everyone. The chairperson observed that members love the camaraderie at the clean, new facility and noted that many might have been at home alone with no one to talk with if the centres were not available. She pointed out that elderly persons learn new skills and brush up on old ones such as knitting and finish their projects at their own pace.